Every week before I go grocery shopping I try to plan our dinner menu for each day. Although I really do enjoy cooking, planning really is such a struggle for me. Somehow at least once during the week, we always seem to stray from the original plan. Whether it’s been a particularly busy day or just a lazy day, sometimes you need something easy. On these days, I pull out my go-to ingredients: pasta, meat, and cheese. I’ve made this recipe so many ways depending on what’s in the cupboard so feel free to stray from the recipe below. Out of mozzarella? Try cheddar cheese for a different taste. No ziti? Give macaroni a try. The key to success is finding the perfect ratio of pasta, meat, sauce, and cheese. Mr. P loves sauce so we tend to go a little bit heavier on sauce than most traditional recipes call for. If I’m not making the pasta sauce from scratch, I like to buy one that incorporates some of my favorite flavors, such as sautéed garlic and onion. 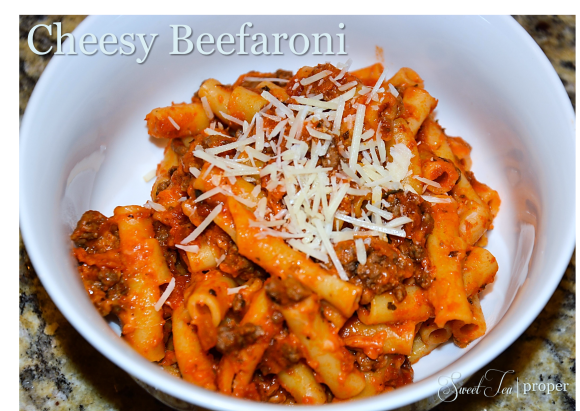 Toss in a little pasta, ground beef, and cheese and dinner is complete! Bring water to boil in medium saucepan. Add pasta and cook until soft. Meanwhile, mix ground beef, salt, garlic prefer, oregano, basil and pepper in a bowl. Place in large skillet over medium heat. Cook through. Drain grease and return to skillet. Add pasta sauce to skillet and reduce heat to medium-low. Let simmer for 10 minutes. Add pasta and mozzarella to beef mixture. Toss until pasta is well coated. Cook for 5 minutes or until cheese is melted. Remove from heat and serve immediately. Top with parmesan, if desired.